Photographs by Scot Facer Proctor, text contributed by Mariah Proctor. 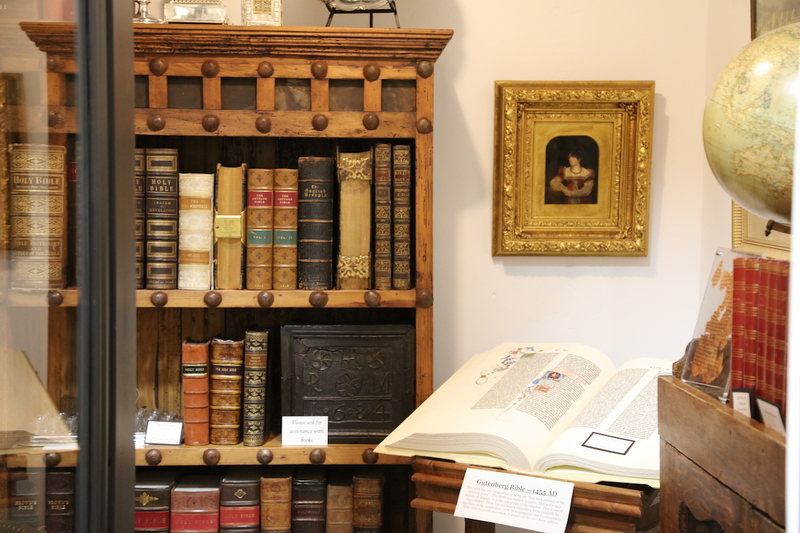 When you enter Moon’s Rare Books, Antiques & Fine Art, you may wonder whether you’ve just stepped into a shop or into a museum. The short answer: it’s both. 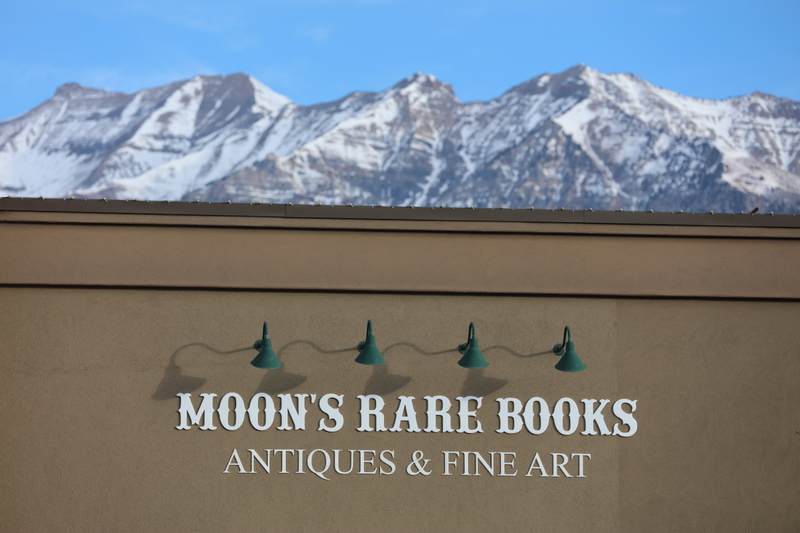 Owner and Meridian author Reid N. Moon says he calls his new space (which officially opened at the Riverwoods in Provo, January 5), more of a book and art gallery than a shop. 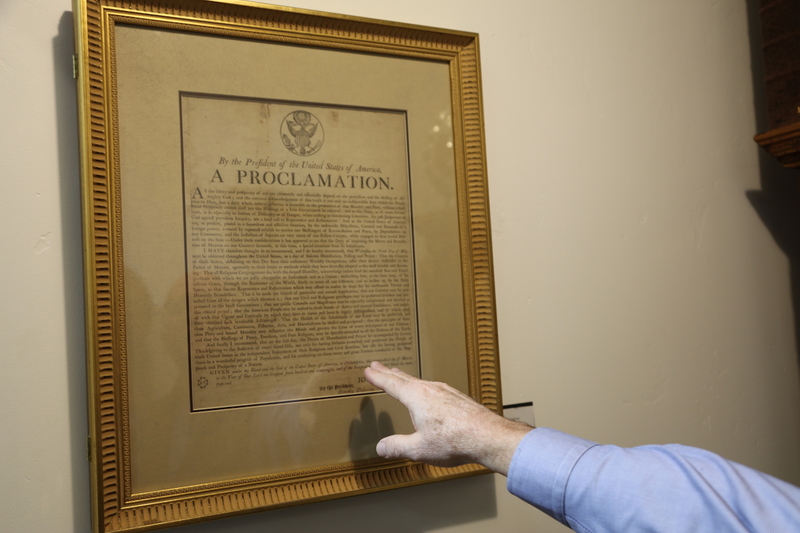 “People can come visit, look around and see the last six hundred years of bible history, three hundred years of literature and nearly two hundred years of early Mormon books and artifacts,” says Moon. Like most good things, the incredible collection on display for everyone to enjoy started small and simple. 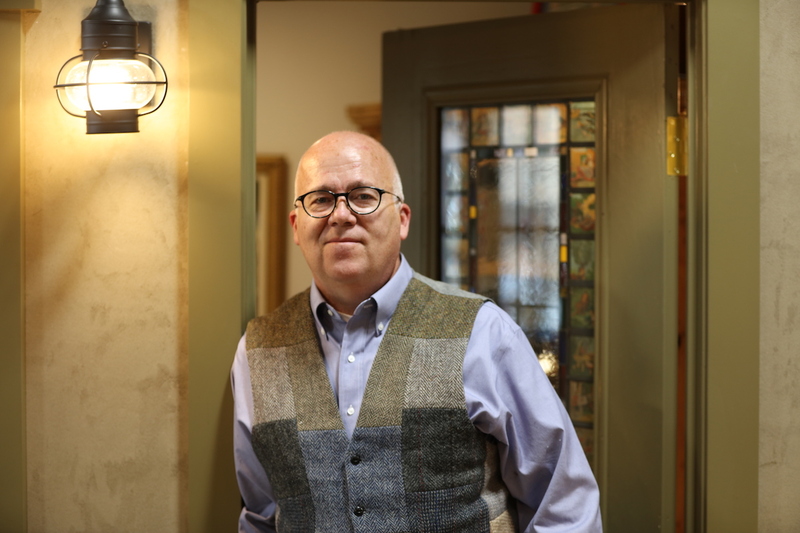 Reid Moon hadn’t spent much of his life reading for fun until he graduated from college and started working in his family’s LDS bookstore in Dallas, Texas. 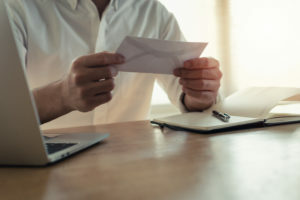 He realized that he was woefully unequipped for the job and so decided to bring home a book a day to read in order to catch up. Three years later, he had read a thousand books. In the pre-internet era, many of the people that came into their family shop were looking for books that were out of print. So, Reid began looking through used bookstores and the D.I., looking for one and two dollar additions to their used book collection. Before long, that became the most popular part of the store and three decades later that “used” section has graduated into a treasure trove of the best of the best books. 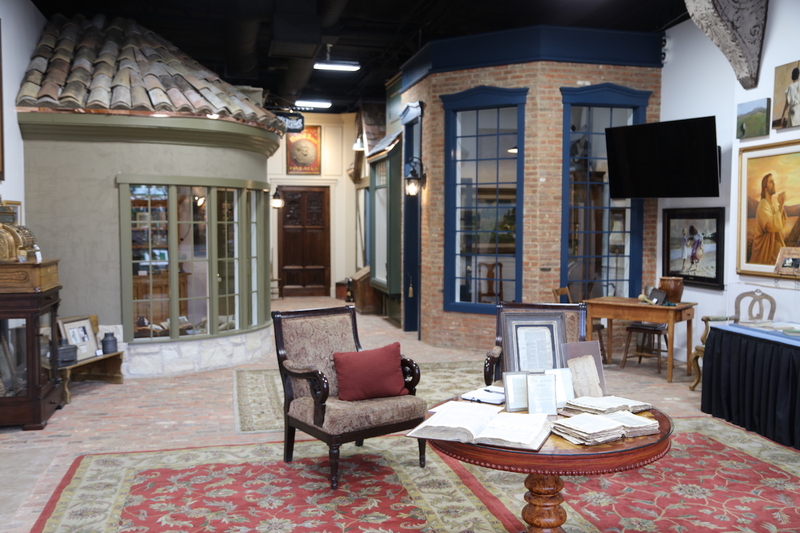 Come with us now as we show you just a few of the exciting things you can come see for yourself at this new place that is part shop, part museum, part wonderland, and conveniently located in Provo, Utah. 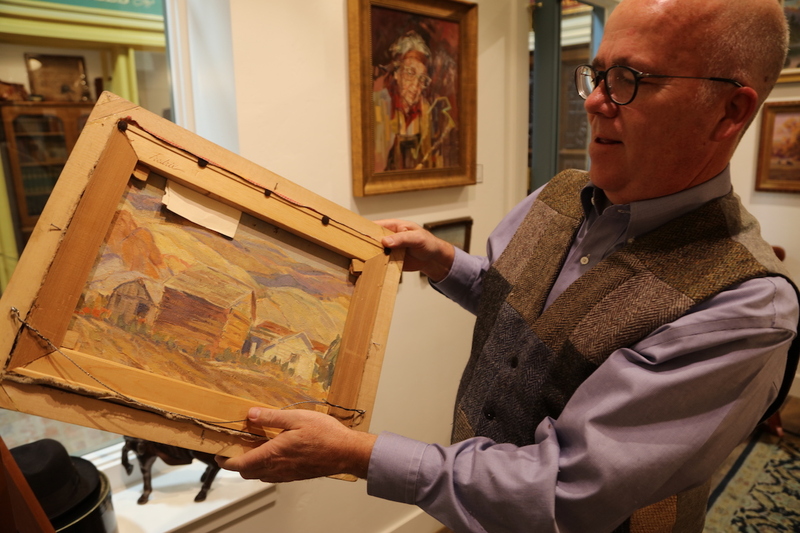 Nestled between restaurants and clothing stores, you might not have guessed that inside this building you can find everything from a first edition Winnie the Pooh to a Hyrum Smith’s personal copy of the Book of Mormon. 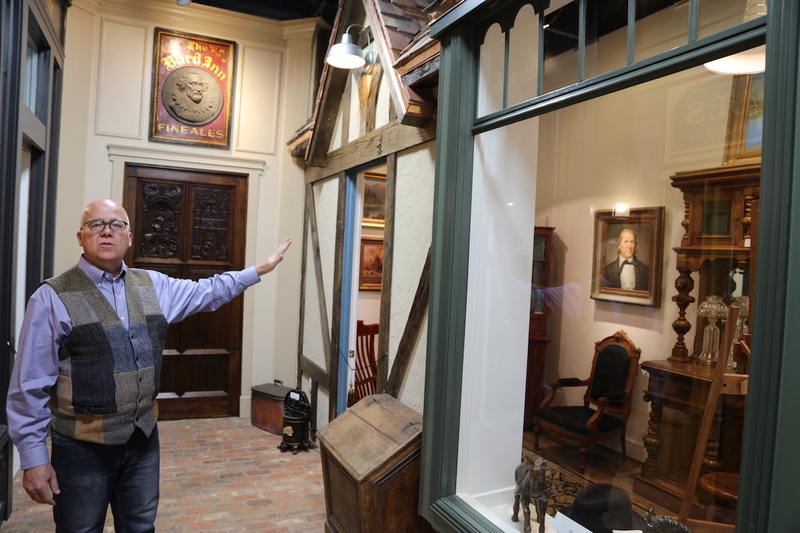 The shop is intended to have the feel of quaint little English village with six smaller shops inside, each specializing in something different. 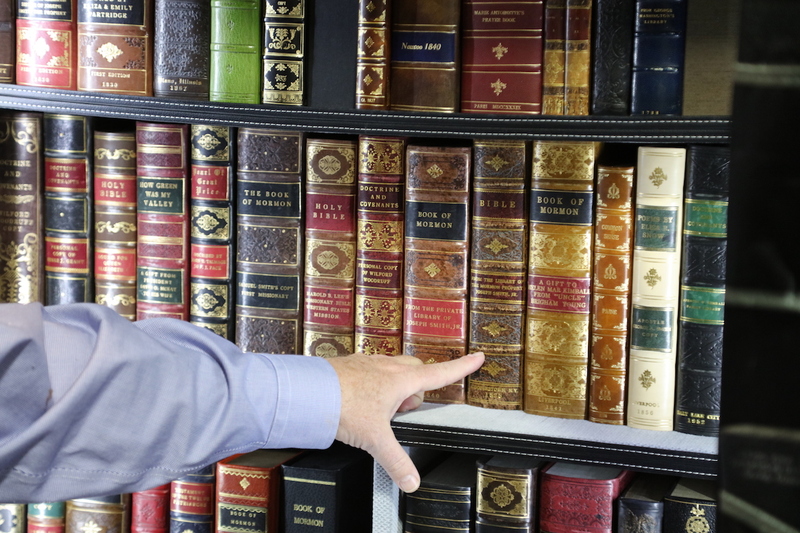 The specialities include antiques, children’s literature, and bibles. 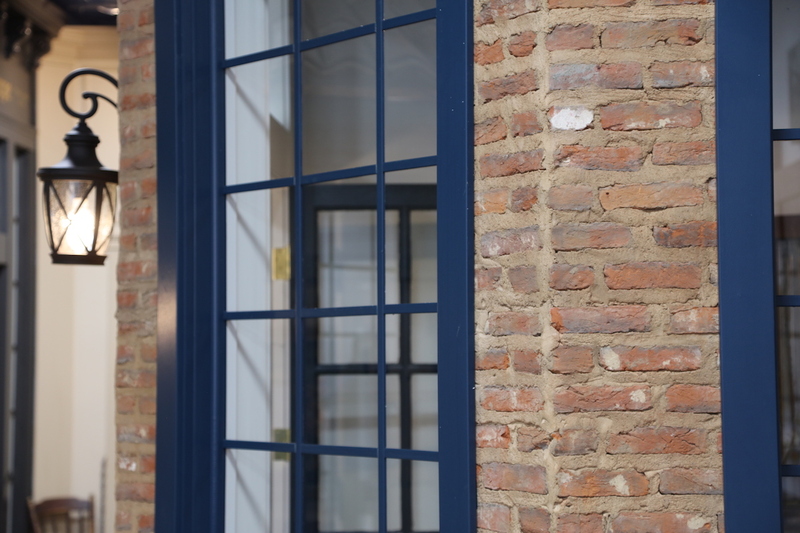 The brick covering the floor and extending into the facade of this shop is over 200 years old. It comes from France and dates to the time of Napoleon. 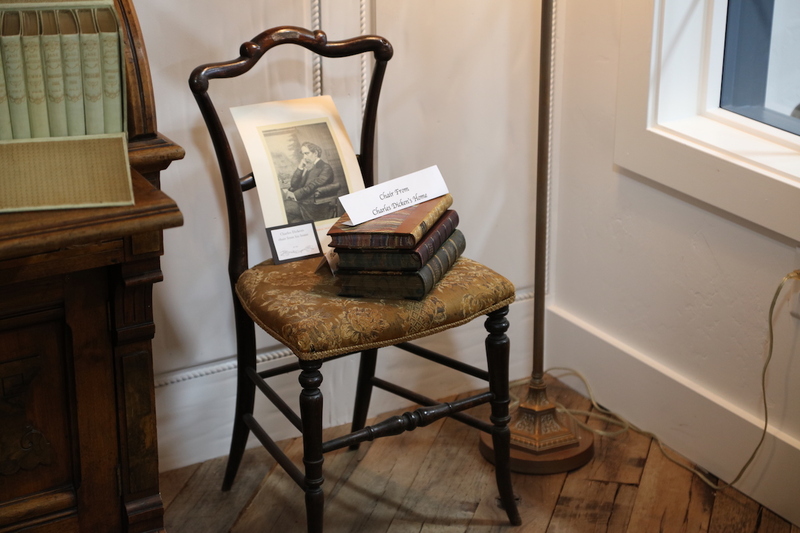 This is currently the only chair from Charles Dickens’ country home, Gads Hill, that is in North America. On the top, you can still see the brass plate placed by Dickens’ caretaker to authenticate his household items after he died. The Tudor-style stucco facade of the shop in the corner is modeled after Shakespeare’s home in Stratford-upon-Avon. If something in this shop looks like it could be antique or modeled after a real place, it probably is. This chair belonged to Brigham Young. It was acquired through his wife, Harriet Amelia Folsom. She is sometimes referred to as his favorite wife because she was always at his side during public appearances. 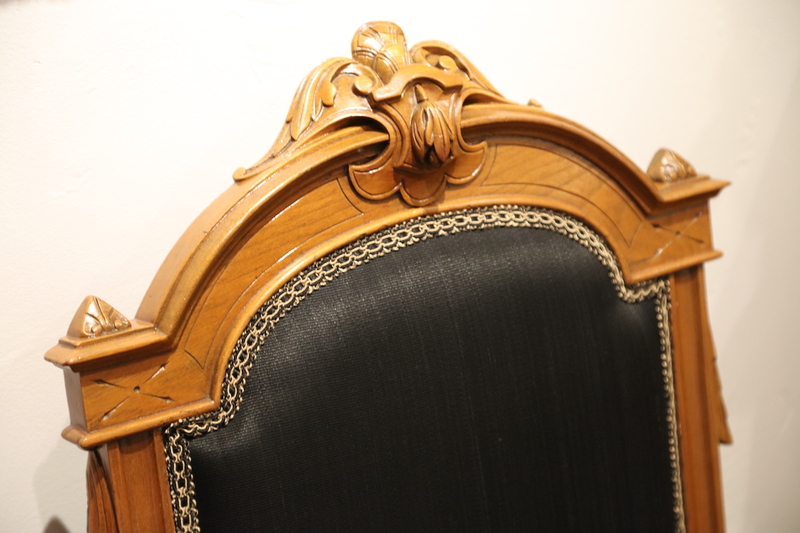 The upholstery is weaved out of 100% woven horsehair. 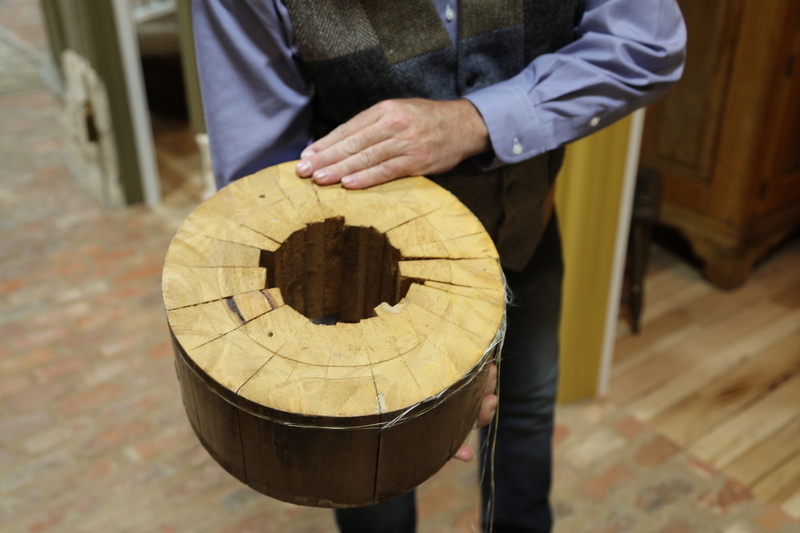 The item in the center is one of the top posts from the gates of the newly restored Nauvoo Temple. That makes it a more contemporary treasure, but a treasure nonetheless. The gates that were originally placed on the restored building were not high enough and so were replaced with higher ones and this is one of the pieces of what was removed. 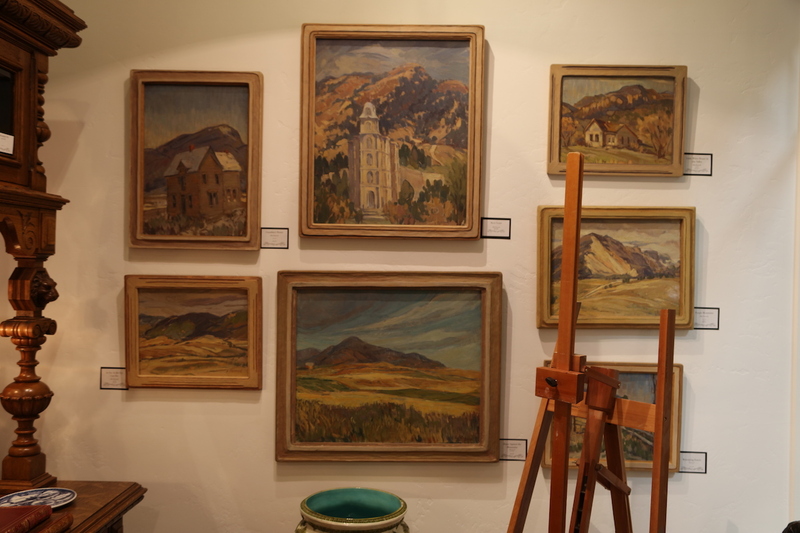 These paintings come from the woman known to some as the “Matriarch of Utah Artists”. Ella Peacock was an icon in Spring City, Utah. Though she was very poor, she would make her own frames and continue to paint. She would even use both sides of the canvas when she didn’t have money for more supplies. “I think she would be shocked to know how much her art is worth today,” says Moon. Among the treasures in the “Antiques and Collectables” shop is this item, on loan. It is a post taken out of the Salt Lake Tabernacle in order to make room for the first news cameras to be brought in for General Conference. It is amazing to see the craftsmanship and creativity of the pioneers in creating this pillar from so many separate pieces of wood. 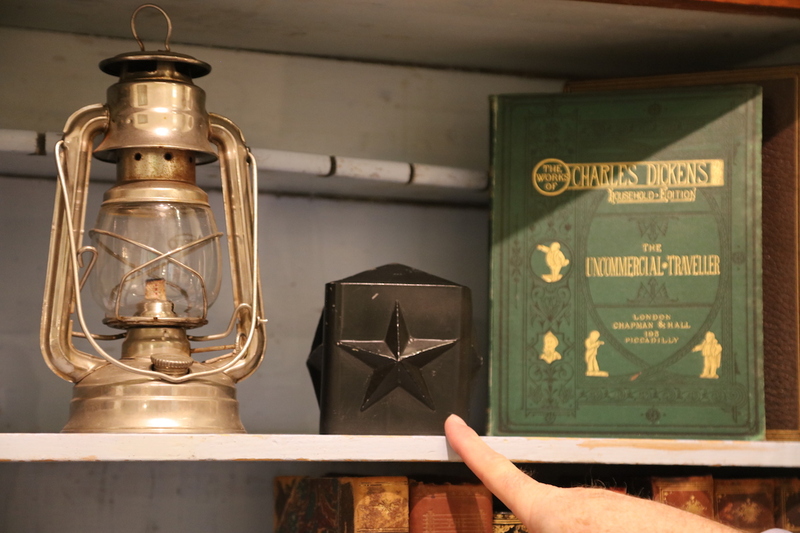 You come to this shop and you can’t help but learn some new piece of history along the way. New acquisitions are being made all the time so the experience continue to change from visit to visit. “We have the largest selection of bibles for retail sale probably in the world,” says Moon. Most bookshops you go to will have two or three bibles, if you’re lucky maybe ten or twelve. 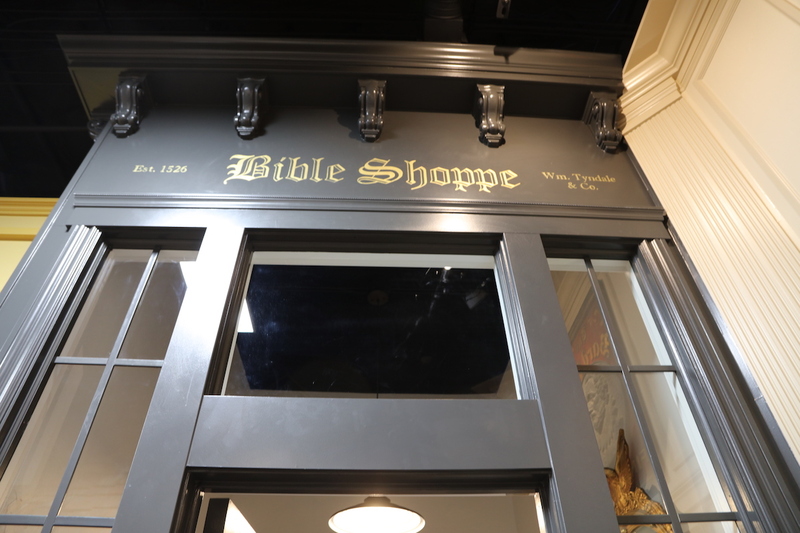 The Bible Shoppe inside Moon’s Rare Books has 280 different bibles from the 1400s to the present. 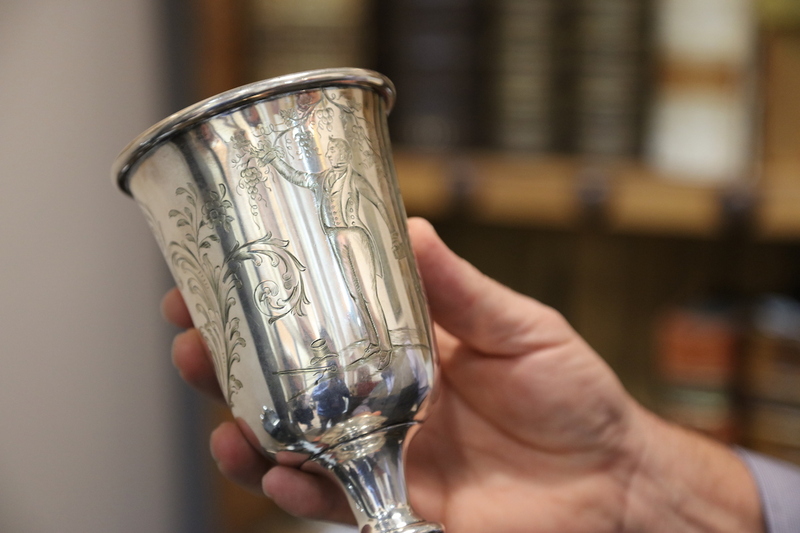 This is a communal sacrament cup given to Cyrus Wheelock, a friend of Joseph Smith. Engraved in the side is a picture of the prophet holding up his copy of the Book of Mormon. 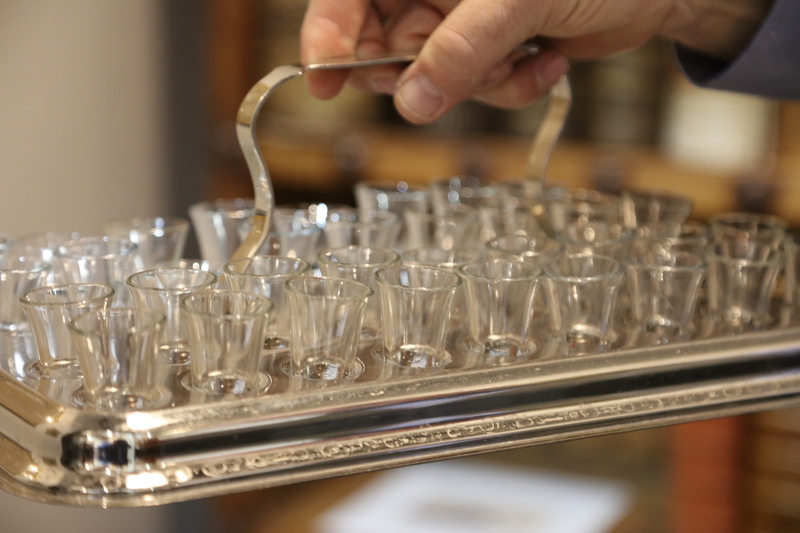 This is not your standard sacrament tray. It is over a hundred years old and has glass cups. With the flu pandemic in the early 1900s, they discontinued communal sacrament cups, but these glass ones continued until the 1940s. 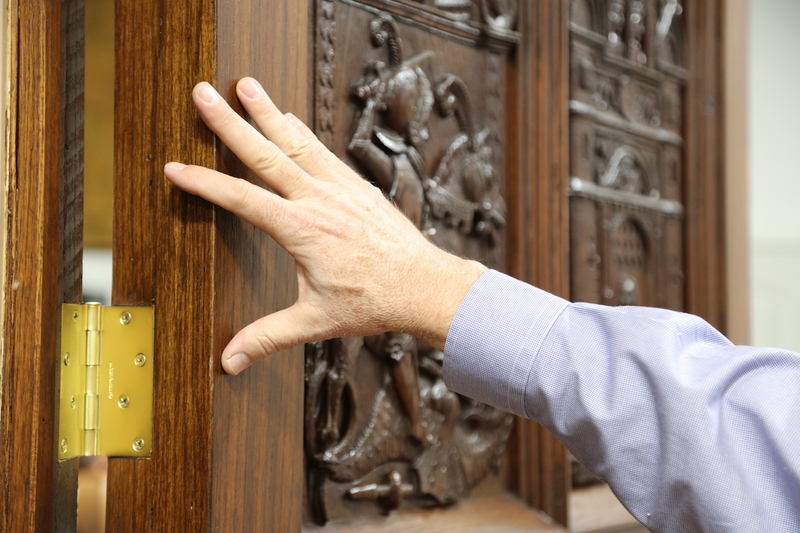 Even this door to Reid’s office has its own rich history and design. It depicts St. George slaying the dragon and is taken from the interior of a castle in England. The heavy, intricate door is four inches thick. The back office contains many of the most impressive and valuable artifacts. Behind him on the wall is Arnold Friberg’s color study for his painting of Abinadi and King Noah. 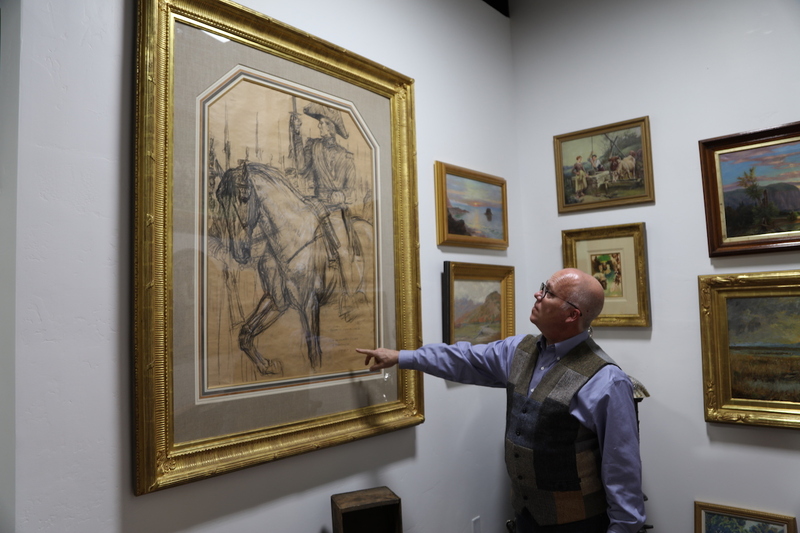 In the foreground is a Friberg piece that was never completed, “General Joseph Smith Reviewing the Nauvoo Legion.” The shop also displays the only known sketch from The Prayer at Valley Forge, which the painter had gifted to his dentist. 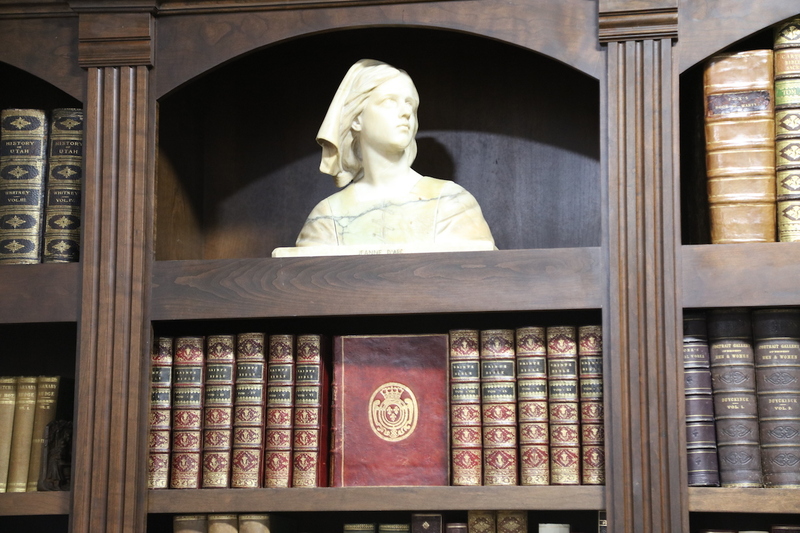 Below the beautiful marble bust of Joan of Arc is a fourteen-volume bible that belonged to Louis XV of France. It is in French and Latin and includes commentary and extensive illustrations; a very expensive commission. It’s bound in crimson Morocco leather for the King. 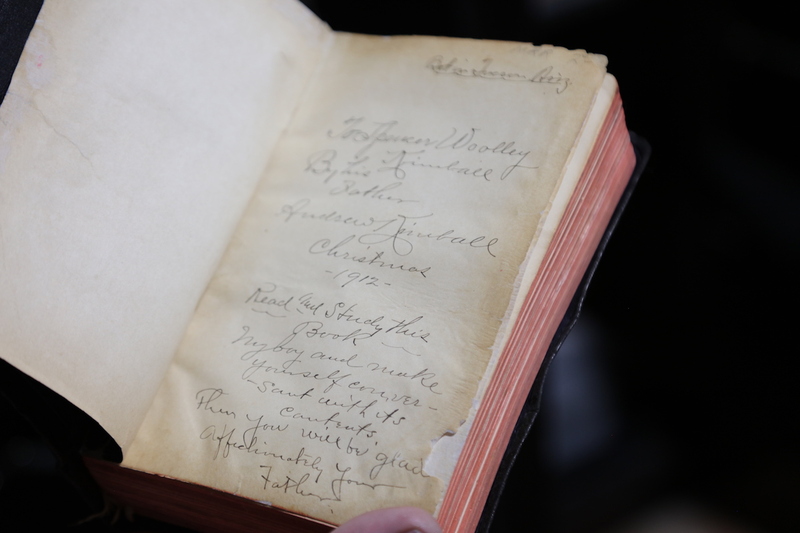 The vault also contains scriptures and books belonging to other famous historical figures. 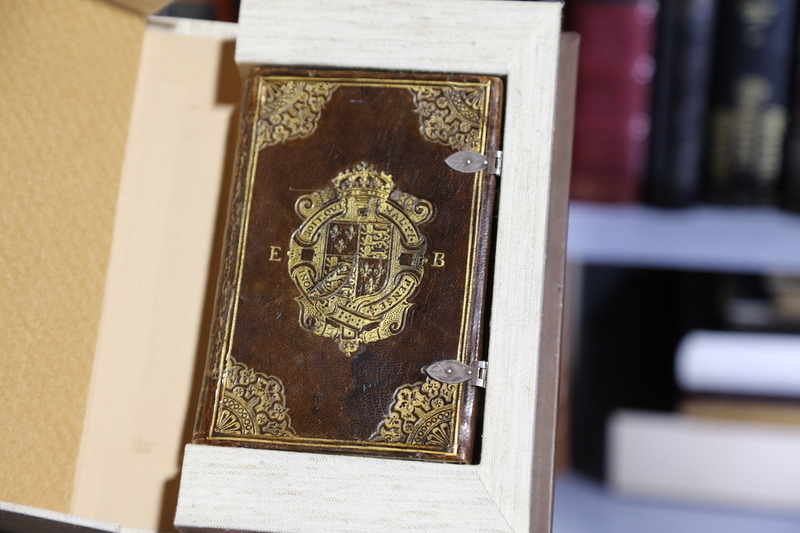 This bible, for example, belonged to Elizabeth I, the virgin queen. It dates to 1589. 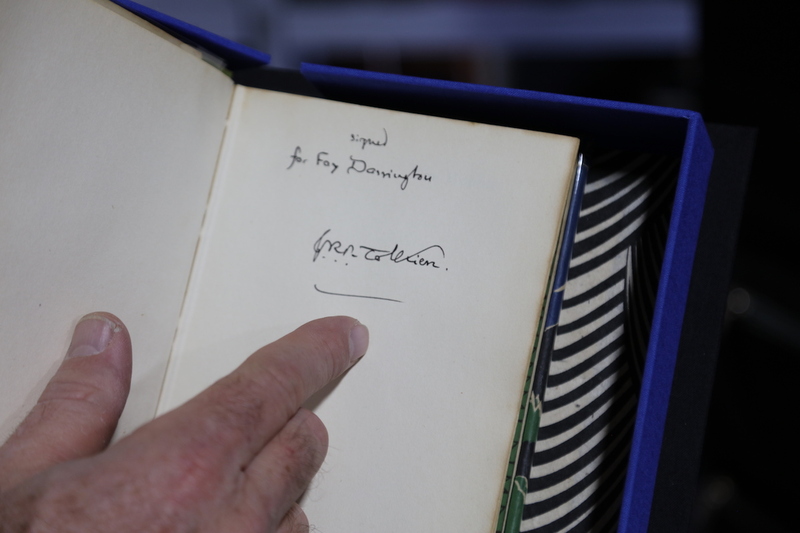 There is also a copy of The Hobbit signed by its author. 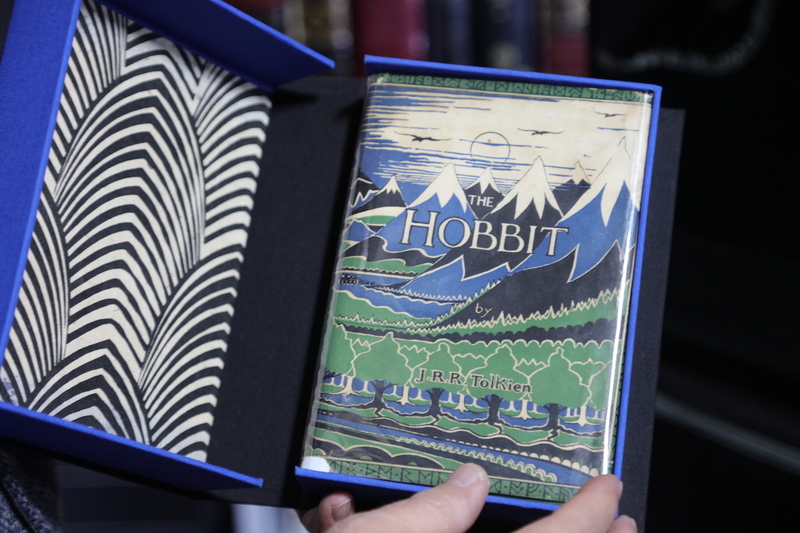 There is no other signed copy of The Hobbit for sale anywhere in the world. 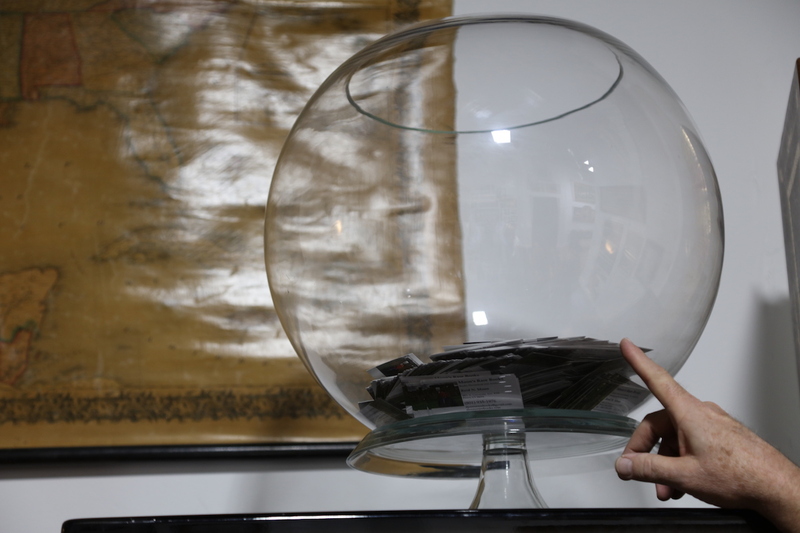 “He only signed a few dozen and you just never see them surface,” says Moon. This belonged to Pope Pius XVII, who excommunicated Napoleon. This cover features his papal arms and silk ribbons. So when he was leading mass, this would’ve been the book he was using. 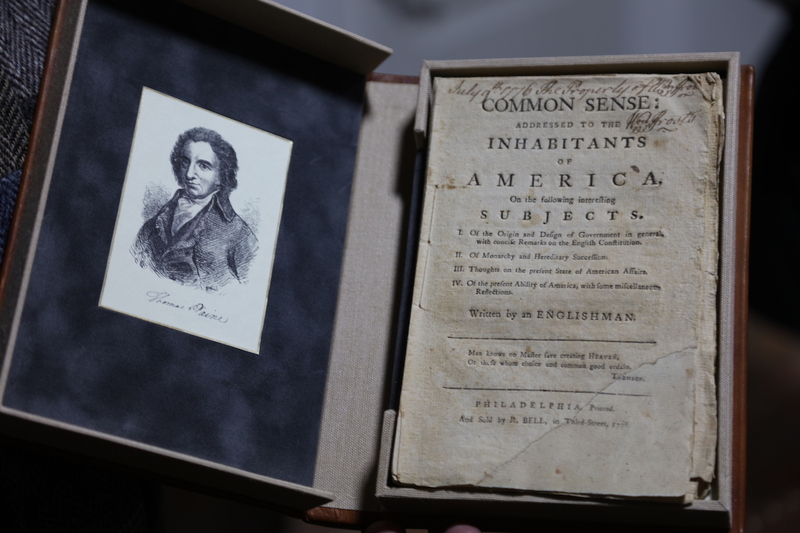 This is Joseph Smith’s Nauvoo copy of the Book of Mormon. 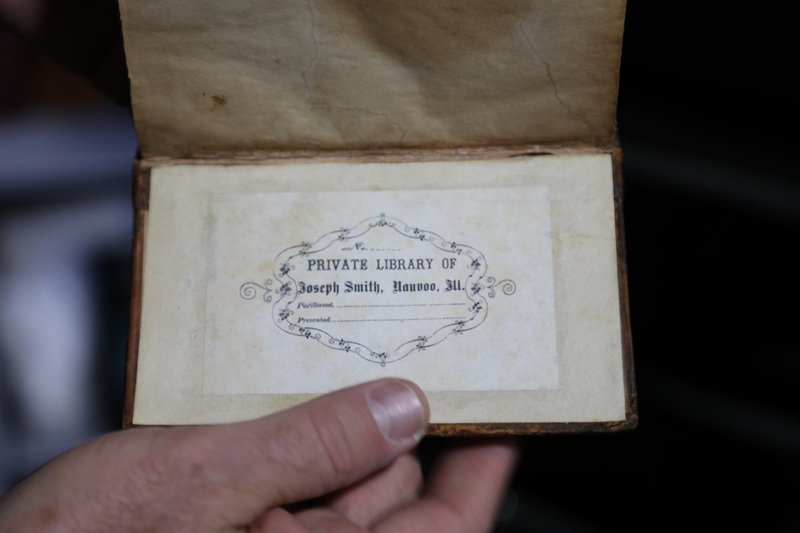 It is the third edition, which was printed in Nauvoo, and still has his book plate inside. He quite possibly would’ve had this in his pocket while he was giving his King Follett discourse. 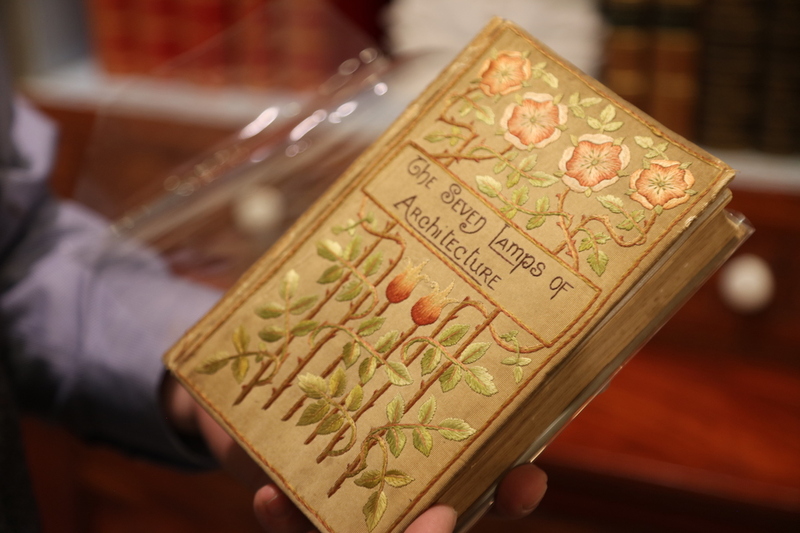 The Book of Mormon editions would remain pocket-sized for the next 58 years. There would not be a large copy until they did the pulpit edition of 1888. 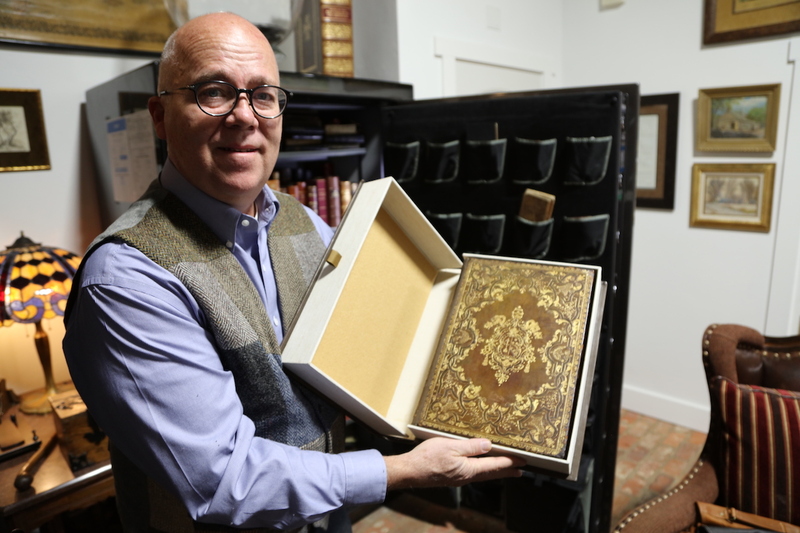 Moon’s Rare Books also has Hyrum Smith and Samuel Smith’s personal copies of the Book of Mormon. 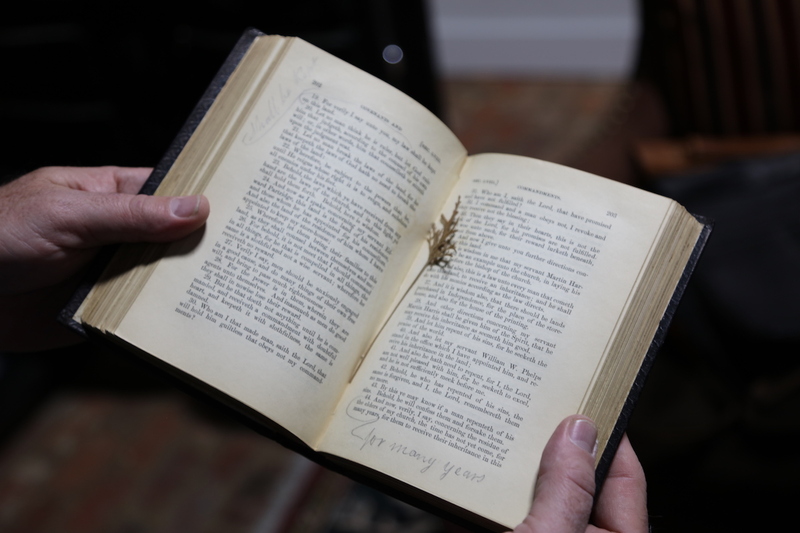 Along with Brigham Young’s chair, Reid acquired his last set of scriptures, from 1876. 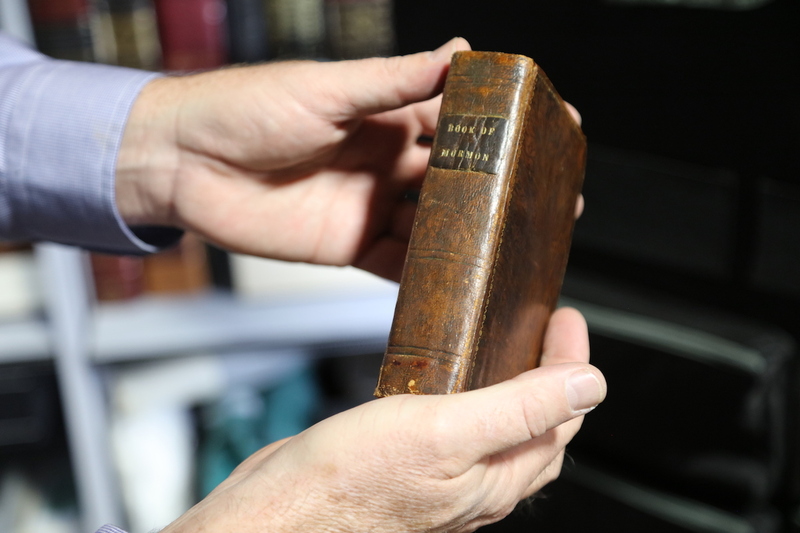 “I’ve seen several sets of his, but this is the first one I’ve seen that is highly annotated with his notes.” It is the first edition of the Doctrine and Covenants printed in Utah and it had 26 new sections. It’s the first one to include sections 121 and 122. “Where else will you see something like this? Most collections like this are under lock and key. The most important books here and locked up here too, but we still show them.” The friendly staff of Moon’s Rare Books are ready and willing to show you around and answer any questions you have. 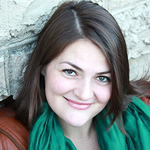 “I love sharing these stories with people who want to hear them, especially youth. I love the look of amazement when they see something they’ve only heard about,” says Moon. Thank you Scot for the great article, It was so fun to have you come and interview Reid. I know your schedule was hectic to say the least. 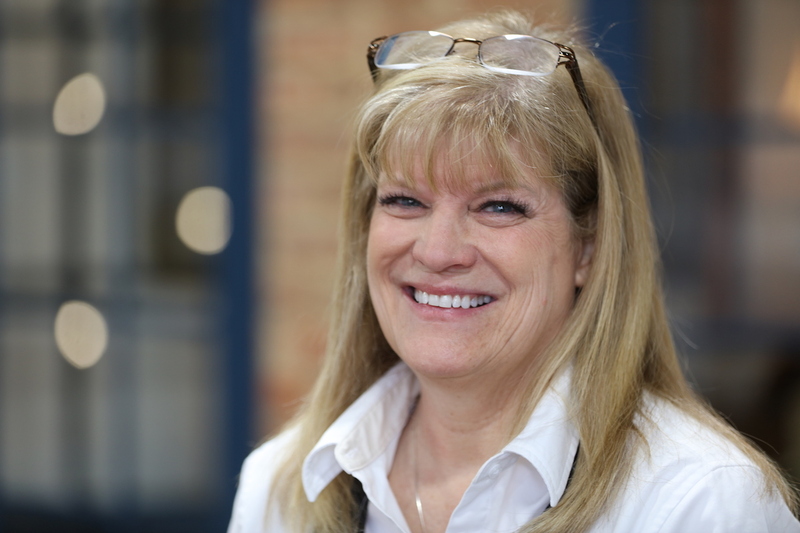 We appreciate all you and Maurine do. I so wish I lived closer. If I make it to Provo, I’ll definately be there. I also would like to look at the history, and of course the out of print books. What an awesome thing you have done for your community and the world.